Are you looking for ways and means to make your windows pristine once more? Do you want to know how to skip chores like window cleaning without lifting a finger? You have picked the right company – the specialists of window cleaning in Willesden will take care with this matter in the blink of an eye. Your windows along with their framework and ledges will look perfect, we promise that! You will no longer need to sacrifice your leisure time – the results of our work will fully fulfil you. Our services blend first-class quality with modest price rates, so don't procrastinate – place an order now to save time, effort and money! We also provide our professional services in nearby areas: Harlesden, Queens Park, Childs Hill, White City, Bedford Park. We promise that the windows of your office will be nice and spot-free, like newly-purchased. Get that by just booking our commercial window cleaning. For glass surfaces as high as the fourth floor, we utilise water fed extension pole equipment which is totally safe and efficient. London is famous for it's tall buildings. So when it comes to those high-rised windows we will bring our rope access team. With this efficient method, we can give you results surpassing any other! You can rely on the team - they are one of a kind specialists of window cleaning. They all have gone through complex training sessions, so you can get second-to-none help for all glass surfaces types. What we can clean includes: single, double, sash or bay windows, garden windows, French doors, patio doors, conservatories and roof windows. Your property can be improved instantly with our help. Get in touch with us any time you need professional window cleaning for your house or office. We provide top-notch window cleaning by using next-generation techniques. We provide impeccable and absolutely clean look for your glass surfaces, roof windows and conservatories with water-fed cleaning system and jet washing. The poles we use are attached to water supply in our vans, thus eliminating the risk of damage to the exterior of your home or workplace. In addition, we use totally safe rope access equipment to clean glasses on high-rise buildings. You can take advantage of these methods instantly – phone us on 020 3746 3113! 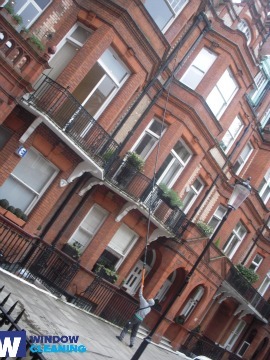 With our quick and efficient residential window cleaning in Willesden, you will improve the look of your home at once. We utilise purified water for inside and out cleaning of your windows. We make this possible by using ground based water-fed extension pole system, which is safe both for your dwelling and the cleaners. Get more information – call us on 020 3746 3113 or use our online booking form. For your convenience we have a chat alternative. Our representatives are on hand 24/7 – you will get answers to your questions. You can be one of our content customers today! The nearest tube station serving NW10 Willesden is Kensal Green.